Published Jan 17, 2019 By Julia Leave a CommentThis post may contain affiliate links. 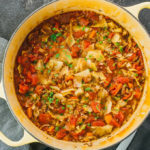 These one-pot unstuffed cabbage rolls are deconstructed versions of traditional stuffed cabbage rolls. They taste similarly, but are much easier and faster to make. 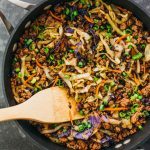 It’s one of my favorite low carb and keto ground beef recipes, not to mention gluten free and paleo friendly. I love eating traditional Polish or German stuffed cabbage rolls, but cooking? Not so much. 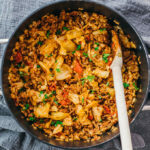 They’re very time consuming: multiple ingredients need to be separately parboiled or pre-cooked, such as the cabbage, rice, and beef, everything needs to be individually stuffed and rolled in cabbage leaves, and it takes more than an hour to bake until the cabbage is tender enough to consume. With my unstuffed version, you can get the same tasty flavors and texture, minus all the hassle. And you’ll save time. 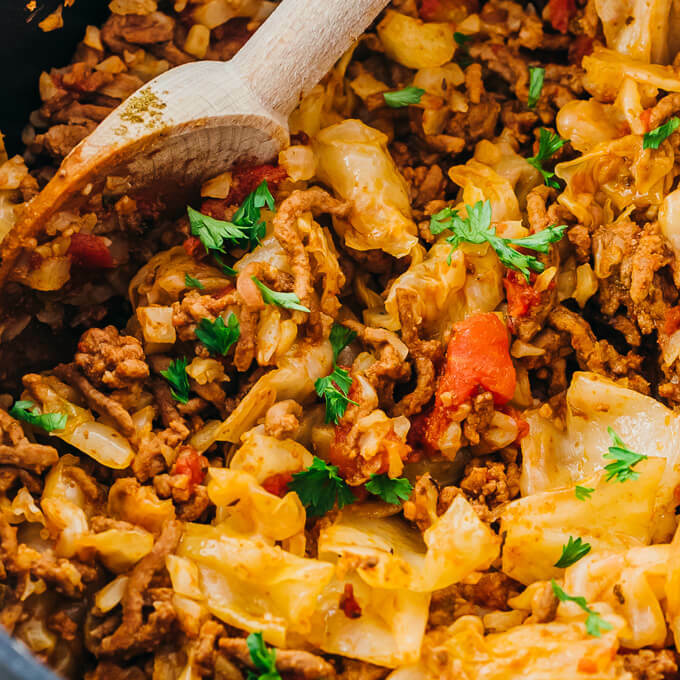 Everything is cooked in a single pan on the stovetop so you don’t need to bother with the oven. 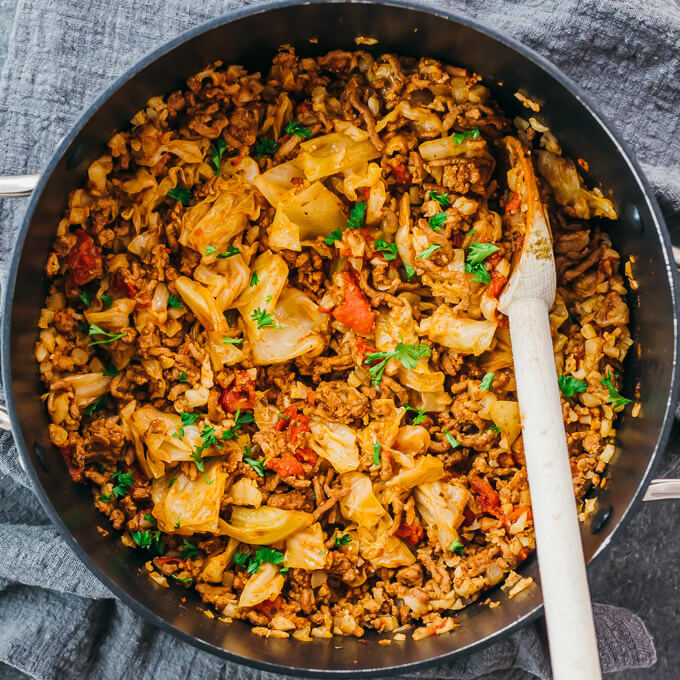 I also swap out regular rice for cauliflower rice to keep the carb count low. 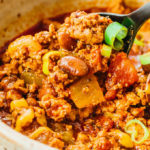 The result is simple comfort food that’s both hearty and filling, and surprisingly low in calories. I love the combination of flavors so much that I’ve also developed a similar recipe in soup form, for which you can find stovetop and pressure cooker versions. I recommend a 6 quart nonstick pot, such as photographed above. Even though the final volume won’t be anywhere near 6 quarts, you’ll need the extra space because raw cabbage takes up a lot of room in the pot. An enameled cast iron pot such as a dutch oven will likely work equally well. Riced cauliflower can be bought as pre-riced packages in the fresh produce section at nearly all supermarkets in the U.S. — I’ve frequently bought them at Trader Joe’s, Whole Foods, and Kroger brand stores. Sometimes they’re labeled as “cauliflower pearls” which means they’re not as finely cut, but they will work just as well for this recipe. Another option is to rice your own cauliflower. 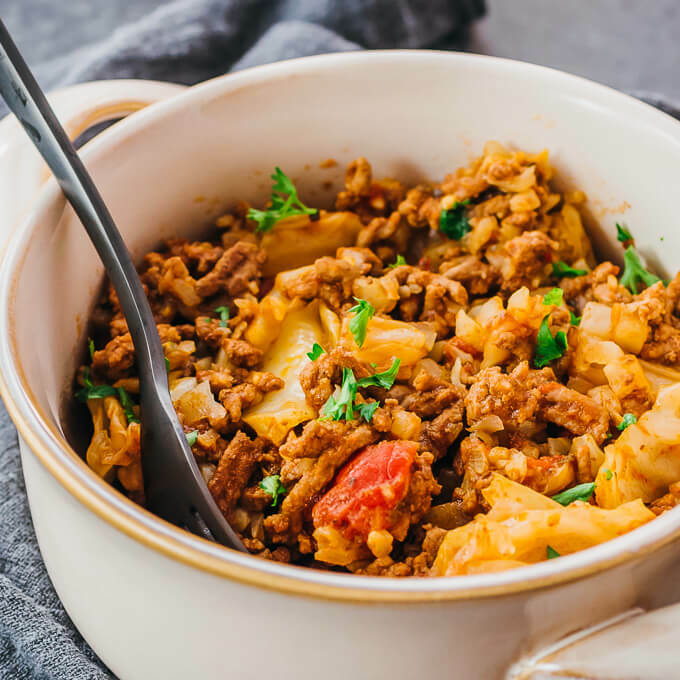 These one-pot unstuffed cabbage rolls are deconstructed versions of traditional stuffed cabbage rolls and taste just like them, except way easier and faster to make. 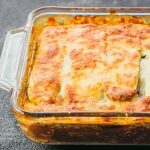 It's one of my favorite low carb and keto ground beef recipes, and also gluten free and paleo friendly. Heat olive oil in a 6 quart or larger pot over medium heat for a few minutes or until hot. Add ground beef and cook until browned, a few minutes, breaking it apart as it cooks. Add garlic, salt, oregano, thyme, paprika, and cayenne. Cook until aromatic, about a minute, stirring frequently. Add all remaining ingredients. Cover with a lid and cook for 10 minutes to soften the cabbage. Uncover and stir for a minute until well-mixed. Continue cooking uncovered until the cabbage is very tender and nearly all of the liquid has evaporated, about 15 minutes, stirring occasionally. If the pot gets too dry before the cabbage is tender, add beef stock or water as needed. Serve while hot, optionally garnishing with fresh chopped parsley. This recipe yields 8.5 g net carbs per serving (1/4th of the recipe).